StsStill making the transition from TT to TC (travel trailer to truck camper). We took off in our first real camping trip over the Thanksgiving holiday with the TC. This is a much easier combination to handle on the road and especially when it comes time to stop for fuel, shopping or for restaurants. Only 21 feet vs 48 to park! Getting it home again is a breeze coming in our primitive little road. Camping in small National Park sites (as here at Joshua Tree) put a smile on my face compared to the hour it took me to turn around one of the last times I pulled into a similar site last year with the TT. Here is the main difference, inside there is much more room in the TT when we dine and entertain. 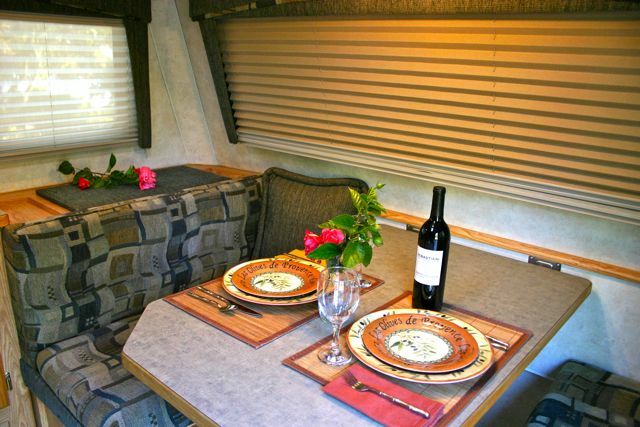 This photo from inside the TT is part of my RV Trader ad since it is on the block. 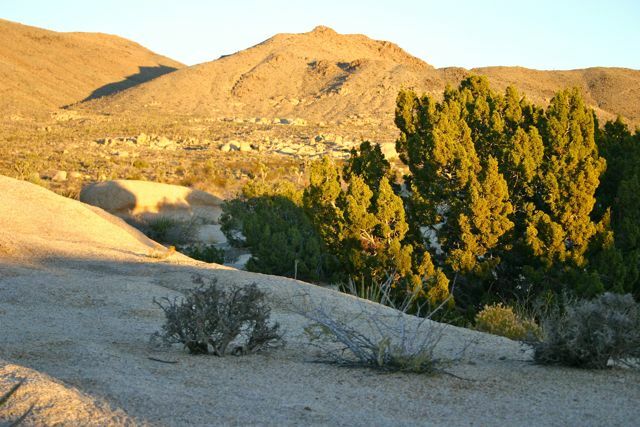 We missed getting to JTNP before sundown, so the ranger pointed us to the BLM overflow camping down near town. 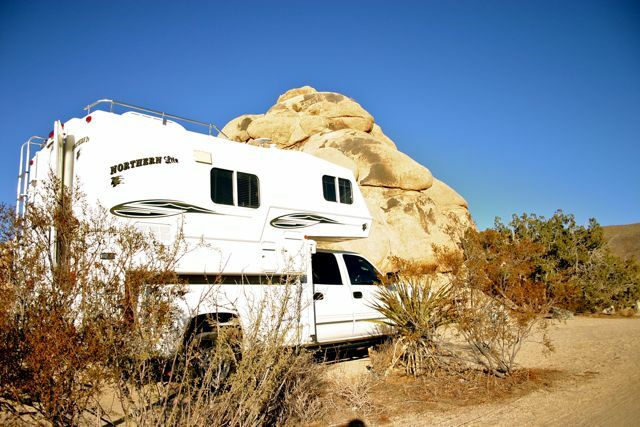 We were among a few scattered RVs out there in the dark and fairly quiet, a better choice than going to the local RV park. 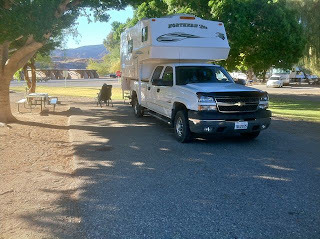 At Belle Camp Ground we parked and went out on the desert for a hike on the California Riding and Hiking trail that courses through the park and ends not far from Haldane's Hole in the Rock. That's what I've been calling it since last year he bet me it was just a shadow. I since found the park calls it the target rock. 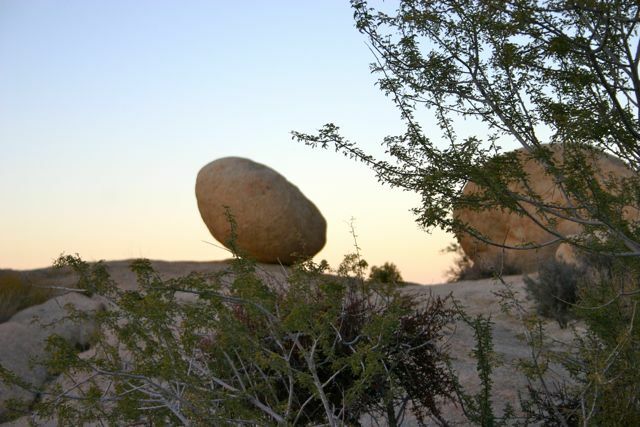 The balance rock is one of many in the west that eroded out of the old world basement and look as though placed in improbably high ledges when in truth they sit where they have for eons while everything around them eroded off to one ocean or another. We moved on to Quartzsite, AZ where my parents wintered and we scheduled a solar upgrade for the TC. If you're looking for the unique in Americana culture, I think this might be the place to find it. Maybe there's still some charm there somewhere. We moved on to Buckskin Mountain north on the Colorado River for a few nights and Thanksgiving Dinner at Tommy's Paradise just up the road. Probably the best turkey dinner in AZ served outside the home. I thanked Tommy for his good work that day as I enjoyed the 8 side dishes along with my turkey, ham and multiple deserts! While at lunch at Lake Havasu, we learned Steve and Debbie Roberts were on their way from Lompoc to stay at the Inn right in our view, surprise! We spent the next morning with them on the lake seeing the sights from their boat before heading out over the sundown-desert on the way home. 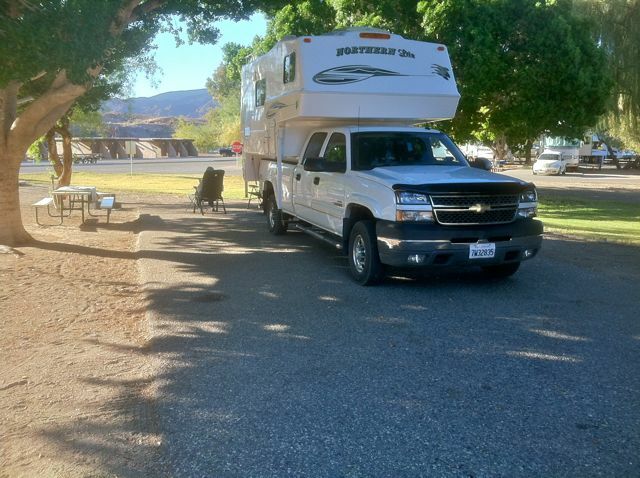 Our last night out was a stop at Newberry Mountain RV & Motel. In the morning we stopped at the famous Bagdad Cafe on Route 66! Don't remember? I vaguely did recall a movie of that name and thought I had probably seen it. Once home I put the movie on and was certain I had never seen it, but enjoyed it more than the cafe! Save your fuel and watch the movie!